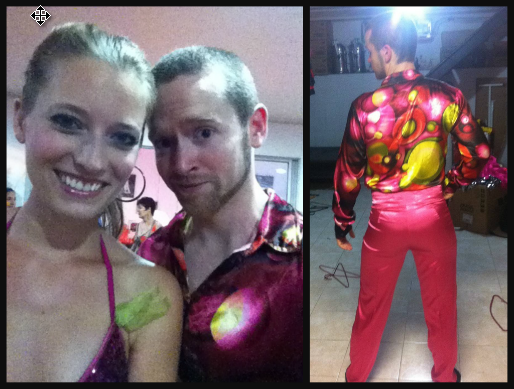 I’ve done a few myself over the years; Salsa in Miyazaki, Japan (when I was just taking my first steps in Salsa), Bachatango (I know, I know) in Dublin, Salsa caleña in Cali, Colombia (wearing the most flamboyant costume you can visualize) and Bachata back on home turf at a few events in Ireland and most recently here in Spain too (hence the inspiration for this article). I’ve always been reluctant to get involved in choreos (I’m a pretty shy guy and despite all my experience with public speaking, shaking my booty in front of large groups of people still freaks me out a little). Despite the initial unease though, I usually feel pretty happy with myself once a performance is over. It’s a great feeling of accomplishment that anyone who has done a choreography will attest to. More than likely it’s the satisfaction of seeing what you’ve been working so hard on for the past however many months, all come together in one big, (hopefully successful) show. Whatever it is, it feels damn good. However, I’ve noticed that there are quite a few people that may be under the wrong impression as to what being part of a choreography group will do for their social dance ability. Worse yet, I’ve met way too many people that feel that doing a choreo makes them a dance superstar. Some folks (thankfully a minority) feel that simply having done a choreography makes them advanced dancers. I think everyone reading this will agree that that simply isn’t the case. Practicing a choreography will make you very good at one thing in particular: doing that choreography! Usually you practice with the same partner who knows exactly what to expect from you. They know what they have to do and they do it, probably even if you make a little mistake here or there. That’s what a good choreography partner does and we should be grateful for it (however, this is definitely not an excuse for the dreaded back-leading in a class setting) . However, try to do some of the moves you’ve learned in a choreography, when social dancing in the real world , and you may end up pretty frustrated. If you fancy the challenge, go for it. It definitely won’t do you any harm. If you don’t feel like it, don’t. It won’t hold you back from becoming a great dancer (we all know that they’re really made on the dance floor). Thanks for the well written report on the positives of performance dancing. There is a tendency to look at dance performances as the highest expression of dancing. This mistake is compounded by how the dance programs at many Universities are directed at entertainment dance professions, thus social dance influence is limited. The dividing line I’ve found is that social dance is done for the happiness of the two partners. whereas performance dancing is done to look artistic to an audience. These separate objectives lead to how performance dancing tends to have larger graceful motions that look good and expressive to a watching audience while social dancers emphasize smaller movements, complexity, collaboration, and improvisation that makes the best use of both partners skills leading to personal enjoyment. While competitions are measured on the judges stand, social dance is measured in how many people you make happy and in how dancers achieve a best collaboration. 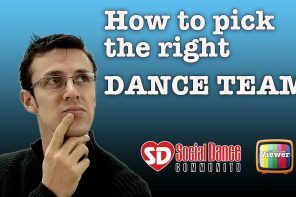 So a good social dancer has the experience to dance well with beginners as well as with advanced dancers. Doing this involves experience and being able to understand your partners ability and skill set so that the lead can improvise a dance at the level of the partner. Improvising means connecting a number of movements together selected for the dance. 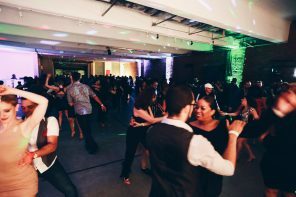 This ability to see several or a dozen possible connections to the next eight music counts is something that is generally not taught in class or choreography but it is critical to good social dancing. Often in a dance I will recognize that a follower has taken a set position and at this point I let them pursue their taught movements and exit my improvised composition and usually this is the best collaboration possible. So from knowing a few movements you get many connections to other movements in social dancing. This aspect is never a part of choreography. In social dance you care what you feel like to your partner, not what you look like. This leads to smaller movements that have a practical dynamics to them. A compact form is desirable and easier to execute to fast Salsa music and the social dancers form is practical and directed at handling momentum well, not at looking expressive or beautiful. Many of the social styling moves are adaptations of arm and leg movements needed to balance the dancer and manage the various dynamics of the dance, so these are basically practical too. Those who limit themselves too much to choreography and don’t take care of their social dance development are going to limit their larger dancing abilities. So performance training can be a good way to get a lot of concentrated practice and training, just don’t think its the best dancing to be had or the only path to being a great dancer. Thanks for the really great comment, David. Thanks for the thoughtful and well written article Richie! Agree with all your points – especially the emphasis of personal achievement, community and confidence that can come with joining choreography. Like you, I’ve always been reluctant to perform in front of large crowds. I always thought that was for the “real dancers” (the ones hand-picked and groomed since they were 3). But being part of something greater than yourself does teach you a lot about teamwork and the joys of sharing art. It also makes you better appreciate the performances of other dancers, since you know much work goes into just 3 mins of choreo. Thanks for the post and have an amazing February. Thanks JJ, Glad you liked it. Yeah, it really does teach you a lot about team work and I definitely appreciate a good choreography even more now that I know how much work goes into it. Keep rockin’ it up in Canada.